﻿It’s been a bit of a crafty creative week this week. And it’s all because of our upcoming school fair. I am helping build a box maze. 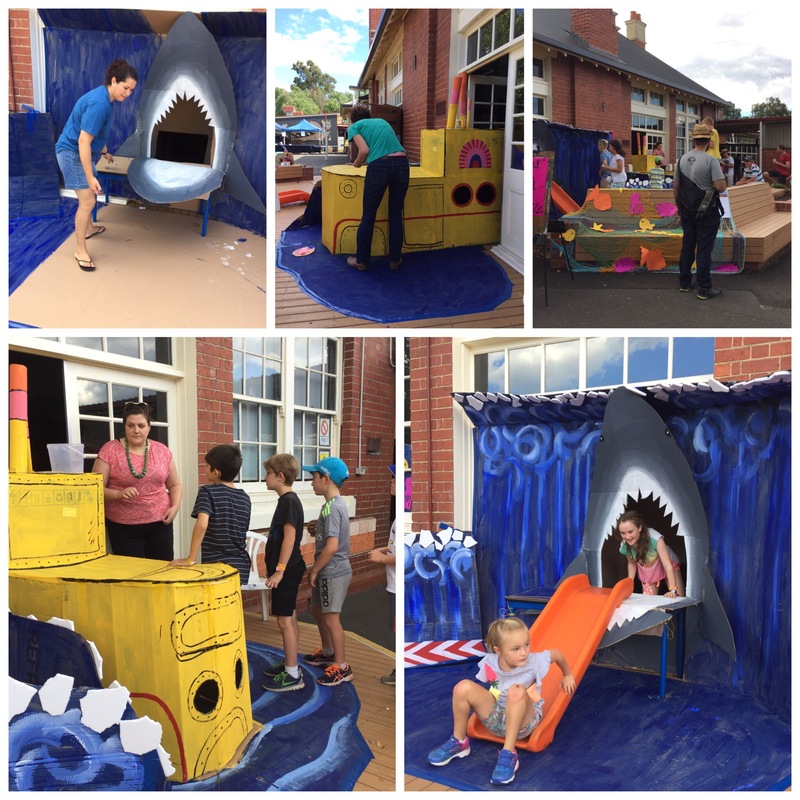 The box maze is going to look like a castle and start from a cardboard pirate ship. Just to make it a bit more fun. Yesterday Wendy and I made the castle entrance and exit. It turned out to be very easy. Our supplies … 2 election booths, 1 Stanley knife and 1 can of black spray paint. Wendy took on the role of architect (funny about that). That is to say she cut the turrets and the doors and windows. And I took on the role of builder … or painter. Well really all I did was wield my spray paint to make the stones. So fun. Maybe I’ll become a graffiti artist … I’ve said it before, but I’ll say it again, I love black spray paint! So, they look pretty ace huh? We’ve left them in Scarlett’s 1/2 classroom. That’s where the box maze is going to be. And I am sure the teachers will be able to find a good use for them til the fair. They’d make a fun reading corner don’t you think? Fairfield Primary School Fair is on Saturday 14 March from 2-7pm (do come along!). And this year Elise, Wendy and I are building a box maze. It’s going to be an indoor one and the kids are going to crawl through the boxes. We saved the election booth boxes that were at school for the recent State Government election. 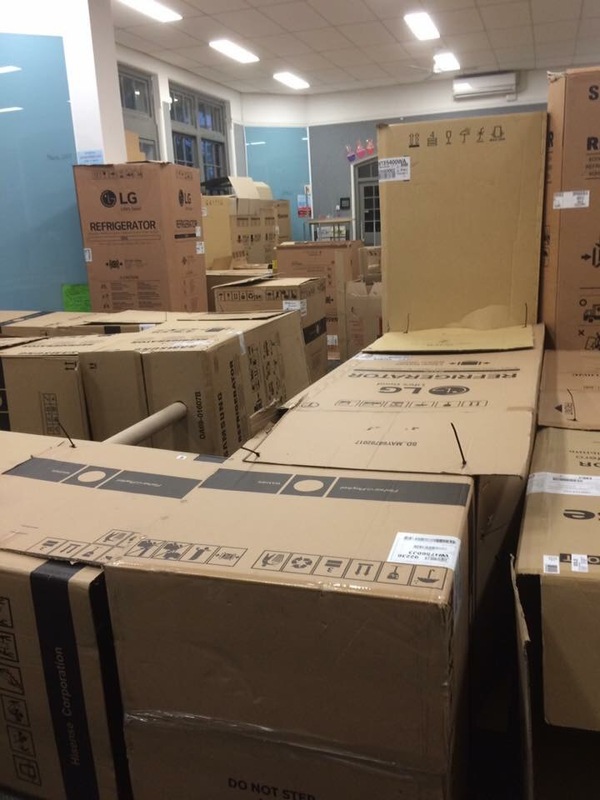 And we have been diligently dropping in to Harvey Norman Preston twice a week to collect all their fridge boxes, which they are kindly saving for us. The aim is 100 boxes. So, the plan at the moment is that the box maze will start on a pirate ship. The kids will have to walk the plank to the island (this will take them up the ramp to the classroom door). Then they’ll enter the castle and follow the maze, climbing to the lookout (they’ll be able to look out a window … a crafty trick to entice other children to wonder what they are doing and visit the box maze), before visiting a fairy glen (fun for the little kids) and entering a pirate dungeon (where the treasure is stored of course). Before popping out at the end via a waterfall (well it will be a slide really …). some of the pirate treasure … my inherited silverware is going to see the light of day! 1. Fridge sized boxes are the go. We are using large boxes to minimise the joining required. 2. The boxes will be joined primarily with cable ties. These make the joins sturdy and mean it is simple to dismantle the maze at the end (we’ll just cut the ties). 3. We will drill the holes for the cable ties. We’ve had a practice and this is a simple process. I’m getting so excited. Today we started working on the dungeon. Inspired by this photo below I am now in the process of photographing the teachers to be part of the ‘pirate picture gallery’. I am asking to take a photo of them dressed up. Fun! Then I am going to make some sort of photo display …. a bit like this hopefully. With the treasure in front! how cool is this room? i found this image on Pinterest. I think my kids would like to be part of it too (the display that is) … the practice run pictures are pretty cute huh?